The ever-controversial Alan Greenspan was Chair of the Federal Reserve from 1987 to 2006, a period marked by relatively low interest rates and market self-regulation. But the economic crisis that started in 2008 shed critical light on Greenspan’s economic policy. He’s 92 now, and as he promotes a new book, he’s sharing some rather radical economic ideas. Entitlements are slowing the rate of productivity growth, and that is a critical factor suppressing GDP growth. Entitlements are mandated, and their volume is largely unrelated to overall economic activity. The 2018 report of the Old-Age & Survivors Insurance and Federal Disability Trust Funds [from the Social Security Administration] shows that despite the fact that everyone says we are funding this stuff, the actuaries are saying you have to cut benefits by 25% for [the Trust] to be actuarially sound. In the 1980s and again in 2010, the cost of benefits for these programs was higher than taxes collected. To accommodate for that, the Fed increased the deficit and, by extension, the U.S. debt. Yet despite these increases in the deficit, the deadline to reduce benefits is getting closer (as soon as the year 2034), according to the report that was alluded to in the Barron’s interview. Given this current predicament, Greenspan reveals some eyebrow-raising thoughts on Sweden, and how the nation pulled their entitlement programs back from the brink. 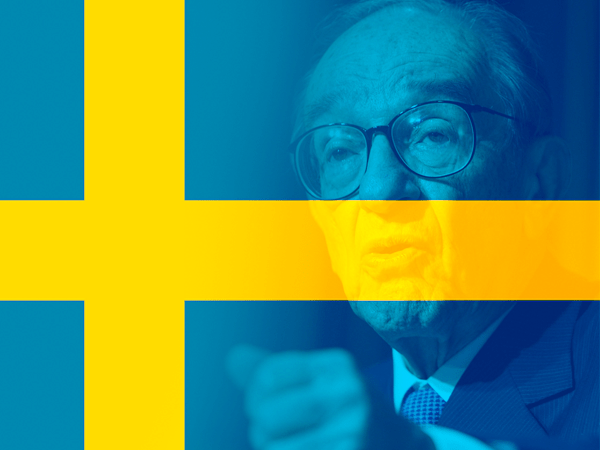 “Sweden has gone through the same thing we have,” Greenspan told CNBC in another interview. In the late 1990’s, the nation faced unheard of mortgage rates that soared to 500% for a short period of time. Clearly, their economic system was in distress. Now, Sweden has a productivity growth rate of 1.3% annualized over the past five years—not great, but better [than many other countries.] We need to change the structure of all the various social programs that have a trust fund to them and go to a defined contribution rather than defined benefit. Obviously, Sweden’s economic structure is tailored to their smaller economy. So while the U.S. government would probably never consider the same radical solution, Greenspan underscores the sad reality that Washington will need to address the program’s deficiency at some point in the next few decades — even if the choices it makes are wildly unpopular to the millions of Americans that rely on it. The only solutions that Congress seems to want to consider are reducing benefits or increasing the contributions that we make while employed. So what Greenspan is suggesting here is unquestionably radical. And while it almost certainly will never come to pass, it’s yet another reminder that changes to the system are necessary. If our government does nothing, the stats are clear: Social Security will eventually break on its own. That’s why, as unfair as it is to the millions of us who have contributed for decades, you shouldn’t count on Social Security being there for you in retirement. You need to make other preparations. Don’t wait until the last minute to add some “self-reliance” to your retirement savings.